Our home-grown pumpkin being carved up for a savory stew. 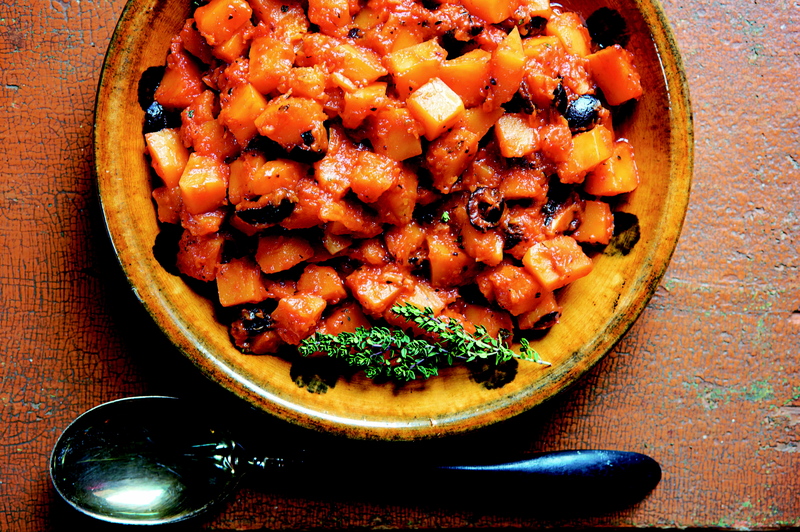 Read about the Venetians’ love affair with zucca, and find my heirloom recipe for savory pumpkin or winter squash stew with tomato, dry-cured olives, and garlic. Any recipes for a pumpkin risotto? 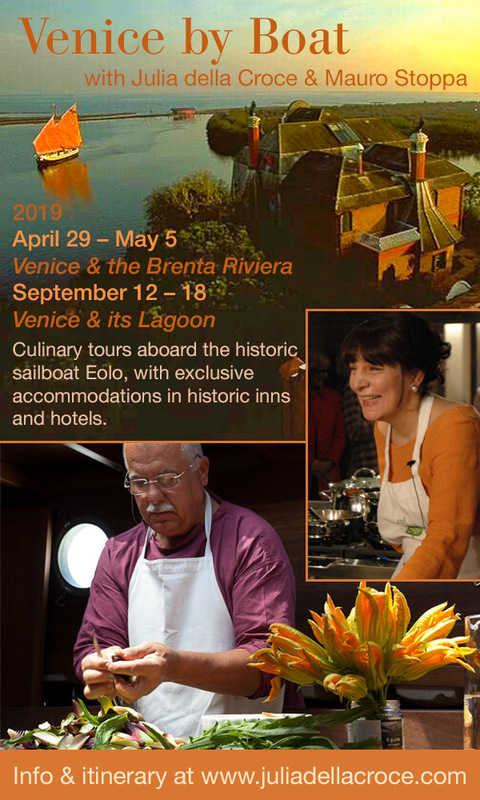 My book, Veneto: Authentic recipes from Venice and the Italian Northeast (Chronicle Books) has a terrific, authentic recipe for it with beautiful photos. I will be writing a post about the dish and its origins in the future. Stay tuned. Hi Julia, Am enjoying your e-mails. That Pumpkin Stew looks wonderful. I’m going to have to grab my copy of your book from the shelf and make it. I do believe I have everything I need. 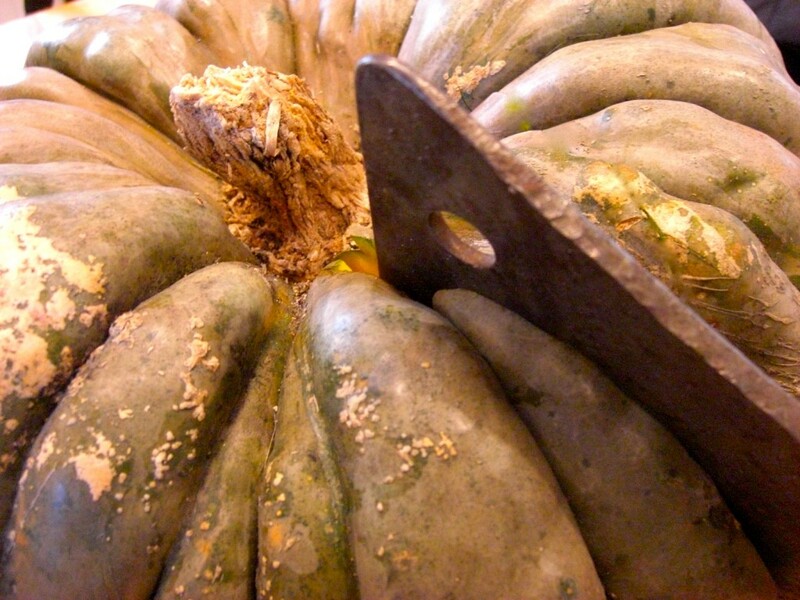 Years ago when I first grew various Italian zucca in my home garden I was thrilled. Such beauty, such truly remarkable looking veggies – I don’t know how else to describe them. Some were covered with what a neighbor’s son called “veggie warts.” Many were multi-hued. There were greens, yellows, beiges, orange tones and glorious browns – you name it. And once we cut them open we were treated to the most glorious interior flesh. I can see why Italians, and Venetians in particular, love their pumpkins. Only a master could describe vegetables like that. I can’t wait to hear how your pumpkin stew turns out. Adri, what a great description! I think in North America, we have tended to overlook this vegetable, a shame. They all have their own distinctive taste and the endless things that can be done with them is amazing. I just started, this past week doing some baking with pumpkin…moving on to pasta with squash tomorrow, then I was thinking of Ottolenghi’s oxtails with pumpkin….sounds delicious! Delicious, simply roasted with potatoes & carrots. Gee, and to think when I was growing up the only thing that pumpkin was used for, besides Halloween, was Mom’s pumpkin pie (the absolute best). Bring them on, I say!